Great West Lifeco announced Thursday that Robert Reynolds, president and CEO of Putnam Investments, was named president and CEO of Great-West Lifeco U.S.
Great West Lifeco Inc. announced Thursday that Robert Reynolds, president and CEO of Putnam Investments, was named president and CEO of Great-West Lifeco U.S. Inc., which owns Denver-based Great-West Financial and Boston-based Putnam Investments. Reynolds will also replace Mitchell Graye as president and CEO of Great-West Financial in May upon Graye’s retirement. 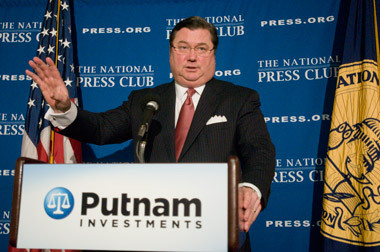 The companies also announced the same day that under the leadership of Reynolds, Putnam’s retirement business will be combined with Great-West Financial’s to create one of the nation’s leading providers of comprehensive retirement services capabilities to small, mid and large-sized corporate 401(k) clients, government 457 plans and nonprofit 403(b) entities. The combined retirement business will reside within Great-West Financial. “I approach this with a lot of excitement,” Reynolds said on a Thursday conference call to discuss the announcement. The combined assets under administration will total $220 billion, and serve more than 5 million participants, Reynolds said. “Bob has been a driving force of innovation and industry progress in financial services for three decades, having led institutional and retail asset management, insurance and retirement services businesses over the course of his career,” Mahon said. The combined retirement businesses, headed by Charles P. Nelson, president of retirement services, at Great-West Financial and Edmund F. Murphy III, head of defined contribution, at Putnam, will report to Reynolds. Nelson and Murphy, Reynolds said, will “work together” on the integration.